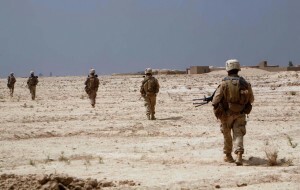 Marines on patrol make their way toward a village in Bakwa, Farah province, Islamic Republic of Afghanistan, May 1. The Marines of Company I, 3rd Battalion, 8th Marine Regiment (Reinforced), the ground combat element of Special Purpose Marine Air Ground Task Force – Afghanistan, are operating in Bakwa to maintain security in the rural area. U.S. Marines are in Afghanistan to reinforce success and sustain the momentum of the ongoing progress by alliance forces. Company I’s mission is to conduct counterinsurgency operations while training and mentoring the Afghan national police.